It was a little bit of a runaway weekend away from the computer, so the updates were few and far between, up until Sunday night, that is. Nevertheless, this is the first Monday of a long stretch of weeks where I'll be waking up at home on some long weekends (for the rest of the calendar year) and the Newsletter could be jam-packed full of good stuff. Maybe. We'll see. The race for the Player of the Week was a dandy one and it went down to the last night of play on Sunday. We had to take the competition to the tie-breakers this morning, after the audit found that a couple of players hit the 8-point mark in Week Five and with 4 goals and 4 assists, Calgary Flames forward Sean Monahan captures his first ever Player of the Week nod on the hockey pool Newsletter. Monahan and the Flames played in four games in the week, winning all four and starting one hell of a run in the standings at the moment. The 24-year old is front and centre on this current winning streak for the Flames notching a pair of points in each game. On Monday, it was a goal and an assist against the Maple Leafs, Tuesday saw a pair of assists in Buffalo, Thursday's return home had a goal and an assist against Colorado and on Saturday, a pair of goals against the Blackhawks. This great week has done wonders for his overall totals, as he has lifted himself into 9th overall in hockey pool scoring with 8 goals and 18 points in 15 games, as the Flames offense has been surging of late. Wes' team has certainly benefited in the hockey pool standings, with his team collecting 27 points and jumping up four spots to 12th place in Week Five. Wes has seen his fair share of Player of the Week nods over the years, this is his ninth mention on the blog for one of his players, the first since Week Twenty of the 2017 season. It only took five weeks, but we now have our first repeat winner of the Mover & Shaker nod and that honour belongs to Grant, who ran away with the race, finishing with a new season-high, 40 points. This is Grant's eighth honour in the years of the hockey pool and the first time he had taken the nod in the 40-point range. It was definitely a big week for him, as his team has recovered nicely from a very slow start, finishing the week in 5th place. Grant's strategy might be paying off better than expected, as he's relying heavily on his forwards and defense this season, unable to really make a splash in the goaltending department. 10 of his 14 players were able to make big contributions to his efforts, while the other four finished with naught, two of which were injury-related, and two of them were both of his goaltenders. 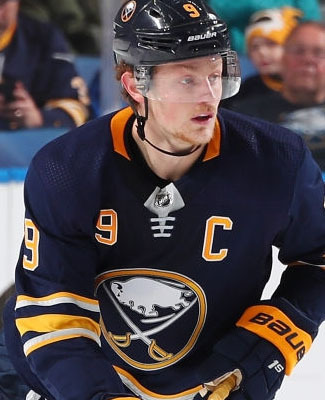 Leading the way for Grant's team was Buffalo's Jack Eichel and Tampa Bay's Ryan McDonagh, both of them finished the week with 6 points a piece. Vancouver's Brock Boeser and Tampa Bay's Nikita Kucherov were both good as well, finishing with 5 points, while Calgary's Mikael Backlund had 4 points in the week. The opening week of the season certainly didn't help Grant's team very much, 10 points and finishing in 24th spot was a crawl out of the gates, but his team has now flown its way up to 5th place after Week Five, so they are prepared to be in the mix for the better part of the regular season now. If he can somehow work on that goaltending situation in the Week Nine Waiver Draft, his team might be one to look out for by the end of the season. In positional scoring, Grant's team currently ranks 3rd at the forward spot, 1st among all defensemen, but dead last in goaltending. I'm sure this was no fluke, as the rush for goaltending does become the crux of a lot of teams in the hockey pool and it looks like Grant is out to prove that theory correct. Oh, how the mighty have fallen! The hockey pool leader from Week One and Week Two has taken a pretty terrible tumble and one could wonder if one player's injury has everything to do with it or whether or not that was a giant coincidence, but Benson's team, since the loss of Auston Matthews to a shoulder injury, has just not been the same all around and Week Five was rock bottom for his pool team, finishing with 9 points and dropping from 4th place to 14th. Three players on his team finished with 2 points a piece to lead the way for his team: Patrick Marleau of the Leafs, Jakob Silfverberg of the Ducks and Drew Doughty of the Kings. Eight players, including both of his goalies, did much, much worse, finishing with no points in the week and acting more as cement shoes in the standings, than acting as his angels, keeping his team afloat in the money positions. According to my counts, since the start of the 2010 regular season pool, this is only the second time that Benson has been featured as the Basement Dweller. It's the first time he's been on here since Week One of the 2014 season, just over five years ago. Now, we get to the real good stuff! If we're going to have to take the trophy away from Stuart, our teams are going to have to work even harder to do so again this season, because the champ is back on top after Week Five! Stuart's team had a really good week, 31 points, and retook the lead at 127 points, even if the lead is only 1 point right now. There are plenty of teams that want a piece of him and have an ample shot at it. Four teams sit 1 point back at 126 points, Brian, Troy, Kristy & Don and Grant have those spots right now. Steve is only 3 points back, Stacey M. is 5 points back, 15 points will stretch as far back as 12th place at the start of Week Six. That's pretty crazy stuff right there, wicked competitive! Even Scott, who sees his team in last place today, is only 39 points back of 1st place, which isn't the end of the world, just yet. Some clever selections at the Waiver Draft has the ability to at least get his team possibly competitive and a touch closer, making the season more interesting. The return of Elias Pettersson to the Canucks lineup did wonders for Clayton's runaway train in the rookie pool, as his team posted 9 points in Week Five, tied his own season-high from Week One in the process and now owns a 14-point lead over John P.'s team, 24-10. If you have been eyeing up the available players page off of the standings recently, you'll notice that there are a handful of rookies available for your picking pleasure, if you so choose. It may or may not get you into this race in a few weeks. The shootout mini-game continues to be somewhat of a dud in the early part of this season, as Week Five only saw a combined total of 4 goals scored for the pool... I still really wish I was keeping track of the number of attempts per week! Of those 4 goals scored, John P.'s team managed to snag a couple of them, bumping his team into top spot in the mini-game, now with 3 goals in the skills competition, to date. Ryan, Jeremy, Neil, Mike and Troy all have a couple of goals each and those teams are in order of their success rate. Troy's team does lead in overall shot attempts in the mini-game with 7 skaters taking their turn, but I don't have a weekly breakdown of that number. There were 45 games on the schedule in the NHL in Week Five, but the hockey pool only collected a disappointing 24 game-winning goals, a season-low when it comes to GWGs and games played. Of course, there were the two shootouts in the week, but even still, in Week Four, we saw 90% success rate in the pool for game-winners ending up in the mini-game. Four teams lead the pool in the game-winners category: Benson, John P., Kristy & Don and Stuart's team all have 9 winners, Chelsea and Jesse each have 8 winners, Brenda & Seward and Grant's team each have 7 winners and it goes down the line pretty quickly. The race is heating up here, which is good, since we need one of these mini-games to be interesting. What about the non-paying mini-games? Any interest there? Goon team of the week belongs to Stacey C., who saw his team collect 28 minutes in penalties in Week Five, taking top spot in the PIM pool with 105 total minutes. Stuart's team, albeit on top of the standings, is also gooning it up well, sitting 2nd with 94 minutes and Jeremy's team is 3rd with 92 minutes. Three more teams were eliminated from the goalie survivor pool in Week Five: Stacey C., Wilton and Neil all couldn't register wins from their keepers in the week and the number of teams still alive, heading into Week Six, now sits at nine. Four of those nine teams already have 10 wins this season and share the favourite designation for the possible winner of the mini-game. Chelsea, Brian, Mike and Wes are all getting good results from their keepers early on. We haven't done much with the team plus/minus much this season, it isn't the most exciting statistic in the pool, but it was a good game last year, I suppose. Stacey C. took top spot in the weekly ratings with a combined +17 in Week Five, but it's Stacey M. that has the overall lead in the mini-game, as her team has been quietly chugging along at a +29 clip. Her team has yet to see a week in the negatives in this competition, so far. Well, the injuries and player demotions have been doing a number to our overall participation numbers of late. The pool saw a season-low in skater games played on average in each NHL game, but on the bright side, some of our goalies are finally starting to return from injury and we saw the second-best average of time spent in the crease for an NHL game this year. It didn't help the scoring though. It was a season low, as the pool only collected 12.69 points on average from the 45 games played last week. We are going to see a busy week though! Week Six is our first week this season with 50 games, so get your points while they're hot! Just before Sunday night's game between the Ducks and the Blue Jackets, Anaheim announced that they would be without their captain, Ryan Getzlaf, for the contest, due to an upper-body injury and that he was day-to-day. There wasn't any more definitive word than that from the team, so we're playing wait-and-see for any more updates in the next day or so. This injury did keep our pool leader, Stuart, from gaining any more in his overall lead, so I would have to think that most teams were pretty okay with this piece of news, if they were watching. No one wants to see Stuart run away with the standings again this year.